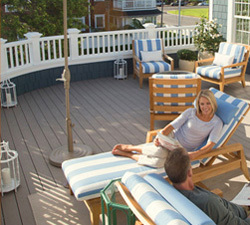 All awnings and shade systems were developed for shade protection. Certain conditions require your immediate attention. When wind conditions exceed 35 km/hr (either steady wind or gusts) the awning must be retracted to avoid damage. 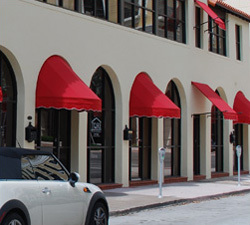 Awnings that are exposed to high wind locations require a wind sensor (motor required). In light short term rain conditions the awning may remain extended provided it is set at a minimum 15º pitch. In periods of heavier rain the awning must be retracted to avoid water pooling in the fabric. When an awning has been retracted wet it should be extended as soon as possible to allow the fabric to thoroughly dry. During winter months when snow, frost and ice can occur, retract the awning. Do not let snow, frost or ice accumulate on the awning, since it will void the warranty. Do not hang additional weights on the awning such as flower pots, clothing etc. If you have purchased an awning with manual operation, please ensure that for most efficient operation the crank operator should be in-line with the eyehook. A motorized operated awning consists of a tubular motor inside the awning axle. The control of the awning can be through a wall switch on the inside or outside of the house. Various switch options are available and a ShadePro consultant will be pleased to explain the functions of your individual control.